Each workshop runs for the duration of 2 hours, and is facilitated by the METC Institute online interactive classroom. The UCAT workshops are hosted by a member of the METC Institute Academic Faculty, and students are encouraged to ask questions and contribute. Each workshop is held multiple times leading up to the official UCAT and is recorded for revision by students. Candidates may enrol in one or more UCAT courses (workshops) or may elect to enrol in a more comprehensive program which combines all UCAT courses into one formalised preparation program. All enrolled students have unlimited access to our expert Academic Faculty for support and advice on any element of their UCAT preparation for which they are enrolled. 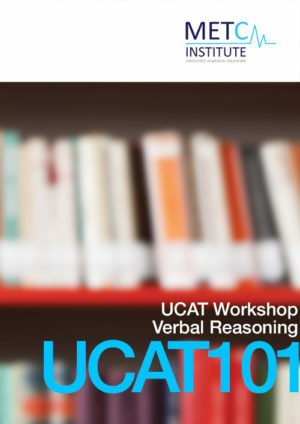 The UCAT Verbal Reasoning Workshop is a specialised UCAT preparation course. The workshop is a two-hour interactive session where UCAT candidates learn how to critically appraise and analyse information presented in various passages. By attending the workshop, students learn core skills in critical evaluation of information presented in a written form. Such skills are vital for both qualified and training health professionals as they are regularly required to demonstrate high-level verbal reasoning skills both inter-professionally, and among their patients. 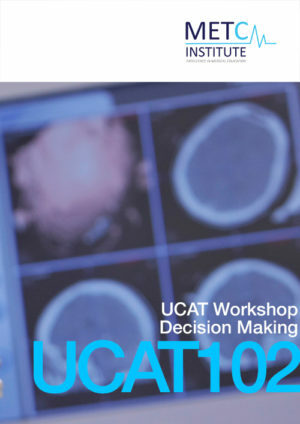 The UCAT Decision Making Workshop is a specialised UCAT preparation course. The workshop is a two-hour interactive session where UCAT candidates learn to formulate conclusions via the use of deductive reasoning. This workshop specifically prepares candidates for the decision making section of the UCAT exam. The workshop assists candidates to build capacities in the application of logic to reach particular decisions or draw conclusions, and to evaluate arguments presented along with other data such as statistics and graphical information. Students are taught the principles of deductive reasoning, and the structured use of logic to solve problems. The use of deductive reasoning in decision making is a vital capacity for medical professional. The workshop is therefore high-yield for candidates both for their UCAT, and their future as a clinician. 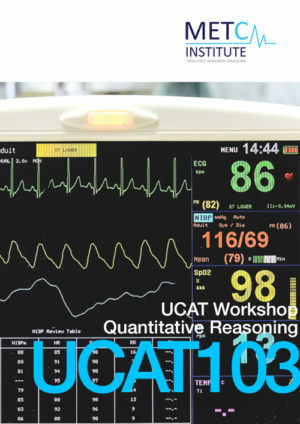 The UCAT Quantitative Reasoning Workshop is a specialised UCAT preparation course. The workshop is a two-hour interactive session where UCAT candidates learn to quickly and accurately use numerical skills to solve problems. The workshop emphasises problem-solving in the context of numeracy rather than focusing simply on mathematics. The workshop assists candidates to build capacities in identifying the quantitative problem, obtaining the relevant information pertinent to solving the problem, and efficiently using both mental and formal arithmetic to determine the solution accurately yet without excessive time-consumption. The workshop also provides students with insight into the key calculations they will be required to perform in the quantitative reasoning section of the UCAT exam. 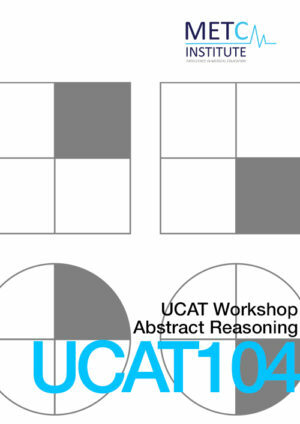 The UCAT Abstract Reasoning Workshop is a specialised UCAT preparation course. The workshop is a two-hour interactive session where UCAT candidates learn strategies for determining patterns and drawing conclusions to solve abstract problems. The workshop assists candidates to build capacities in identifying the implicit rules that govern the arrangement of abstract stimuli. Such stimuli are used in order to isolate and test the candidate’s ability to interpret and correct patterns in a novel context. Doing so will require the candidate to understand the implied governing principles, and then to apply those principles in solving the problem. The process is akin to the pattern recognition and capacity for congruence required in the professional health sciences. 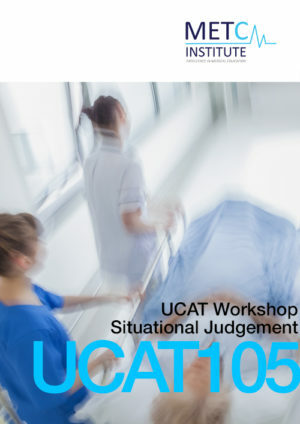 The UCAT Situational Judgement Workshop is a specialised UCAT preparation course. The workshop is a two-hour interactive session where UCAT candidates learn to make objective and accurate value-based judgements based on scenarios provided. The workshop assists candidates to build an understanding of the values of integrity, perspective, resilience, adaptability, and teamwork. Such values are commonly assessed in both pre-medical and post-graduate selection processes. Though specific medical knowledge is not required, many scenarios will be based in the context of the delivery of healthcare. It is therefore essential that candidates develop an understanding of the values which underpin attitudes and behaviour in such circumstances.